Finished worked area is approx. 3 by 5.5 inches. The threads are several strands of floss and Kreinik braid. My leftmost and rightmost stained glass windows have a muted gray-purple thread color used for the lead and for the middle stitched piece I used DMC black satin floss for my lead area. I finished stitching these three stained glass pieces about a year ago. Amazing it took me this long to find a frame and mat that worked for these 3 inch by 5.5 inch worked pieces. 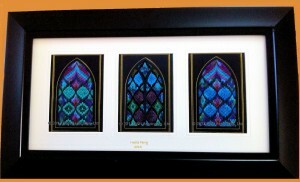 The frame I used is 10 inch by 20 inch with three 5 inch by 7 inch openings. I think matting these in the same frame greatly enhances the viewing of each of them.